Available Land: Approx. 18.2 ha（planned）. Exclusive Industrial District, Industrial District. Sand gravelly, Sand gravelly mixed with cohesive. To enter into a Pollution Control Agreement with the city. To drain after the processing by each company individually. High voltage is available. Special high voltage is negotiable. 3.2 km, 6 minutes by car, from Tanuma station on Tobu-sano line. 9.3 km, 20 minutes by car, from JR Sano station on JR Ryomo line. 1.0 km from National Route 293. 12 km, 25 minutes by car, from Sano New city bus terminal. 200 million yen or more of acquisition amount for invested fixed assets. 10 or more number of full-time employees. 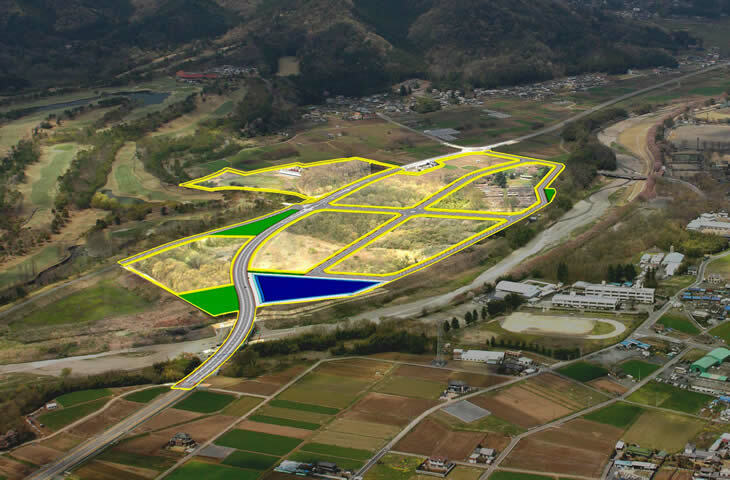 To start its operation within 3 years from the date of the land acquisition. The equivalent amount of the fixed assets tax relevant to the acquired invested fixed assets and city planning tax. To enlarge the size of production facilities. 50 million yen or more acquisition amount for invested fixed assets. To start its operation within 6 months from the completion of the renovation constructions. City residents employment within 180 days in before and after from the start of its operation. Insured employees employed for 1 year or more by Employment insurance Act Article 4, paragraph (1). To joint Ryomo District Employees Welfare Mutual Aid Association. The equivalent amount for the membership fee and admission fee. To provide plant tours for people in general. To arrange facilities for the plant tours. To join Sano City Tourism Associations (one company). 5 % of the cost for plant tour facility arrangement. Limit amount: 1 million yen.